On January 18 NASA released its reported temperature for December, 2017. Based on this, 2017 was the second hottest year on record, trailing only the El Niño year 2016. According to NASA’s table–https://data.giss.nasa.gov/gistemp/tabledata_v3/GLB.Ts+dSST.txt—global temperatures in 2017 averaged 0.90°C (1.6°F) above the 1951 – 1980 global average temperature. 2016 was a record 0.99°C above the 20th century figures. Note that the National Oceanic and Atmospheric Administration (NOAA) data suggests that 2017 was slightly cooler than 2015, making 2017 the third warmest year, but their overall trend line is the same as NASA. 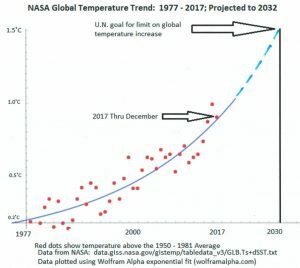 Graphically, the NASA temperature data is shown in the figure below. 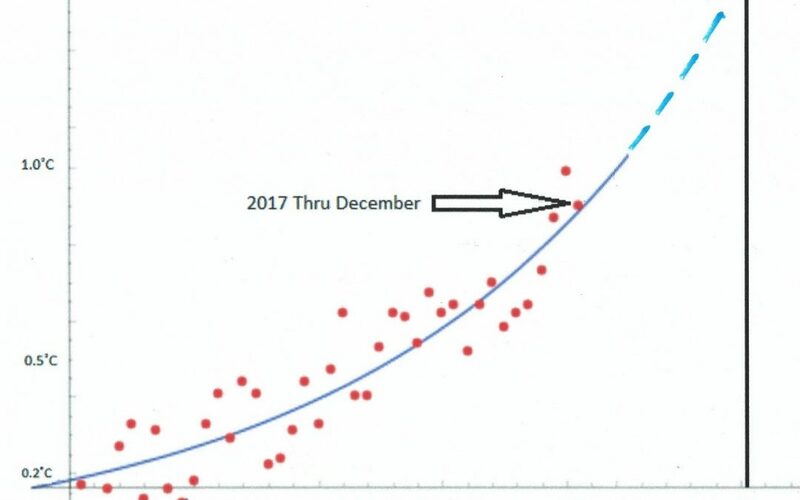 The best fit for the data is an exponential, not linear, line as shown on the graph. The significance of the exponential trend is that the earth’s climate is on a path to reach the UN’s goal of no more than 1.5°C increase by about 2032. The more conservative goal of no more than 2.0°C would be reached in 2040. This means that the goals for reducing carbon pollution need to be accelerated if we are to have any hope of stopping climate chaos. For example, California’s goal of “80% reduction in greenhouse gas emissions by 2050”, although ahead of other states, would still result in climate catastrophe. Similarly, California’s proposal to ban fossil fuel vehicles (see post on 350 BA Transportation Campaign site here) by 2040 would also be too little, too late. This is not to say we should oppose these efforts to reduce emissions. But we do need to recognize that they, like the Paris climate agreement, are only a step in the right direction.